New Delhi: The three-day Pravasi Bharatiya Divas (PBD) convention of Non-Resident Indians (NRIs) and Persons of Indian Origin (PIOs), ended last week after a successful run in Varanasi. The event witnessed participation of Prime Minister Narendra Modi, EAM Sushma Swaraj, UP Governor Ram Naik, CM Yogi Adityanath among others. 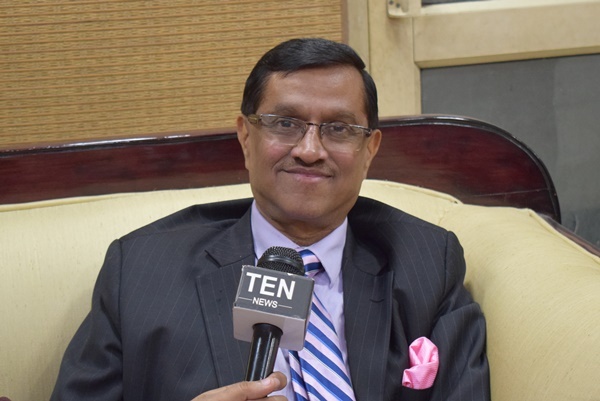 On Tuesday, Ten News caught up with the MEA Secretary and Passport Man of India, Dnyaneshwar Mulay for an Exclusive Interaction on this year’s edition of PBD. How was the response to Pravasi Bhartiya Divas? Whether desired outcomes for PBD have been achieved? Absolutely, the desired outcomes were not only achieved but it surpassed the people expectations. This year the Pravasi Bharatiya Divas was held in a place like Varanasi where normally PBD’s event will not go. So the choice of place was good but this time, the bonus was three in one. After Pravasi Bhartiya Divas we took about 3000 Pravasi’s to Kumbh and most of them I believe took a dip in holy Ganges. And after that we brought them to Delhi in three special trains and once we came to Delhi we were able to take them to Republic Day Parade as well. Overall this seem like a great experience for all. How has been your experience as an Ambassador in USA? I was councilor General in New York for three years. New York is Vibrant but very challenging as well because people are very aware and they are very well educated. So my challenge was to make more people think about india in a positive way. How to resolve their grievances and make passport and visa more friendly, more transparent and efficient was on my priority. So what I did rather than people coming to consulate we reached people by our own. And what about your experience from Japan? In Japan I was doing commercial and economic work. During my time we were able to convince the Toyota Company for coming to India before it went to China. Because at that time they were contemplating to invest in China. My Ambassador told me we must ensure that the investment must come to India before it goes to china and we were successful in doing so. If we talk about overseas Indians Is there any proposal from them to adopt villages or undertake developmental initiatives in India? We had a session called giving back to India and particularly the role the cultural and social organizations can play. So what I understood in those conversations is that lot of our people and diaspora members, are already building schools, building hospitals, working for the local welfare of the children, contributing to Orphanages of india, some people are working for the widows in India etc.. So I think lots of people are already doing it. Under this government to what extent the foreign relations with the strategic counties like USA, Japan and others have been improved. I would say yes and whether it is US, whether it is China, France, Germany, Japan and UK and all the big countries including Brazil, South Africa we’ve had excellent interactions at the top level and each interaction at the top level means new ideas, new agreements, new MoUs. So I can say there has been a remarkable growth.